If any of you have spoken to me about hyung, you will know that my absolute favorite is Naihanchi. To me it embodies everything I love most about Dang Soo Do, and that is nitty gritty-close quarters trapping and grappling. The meaning of Naihanchi is constantly studied, researched and debated. Being that the earliest works we have that detail Naijanchi write it with Katakana (ナイハンチ) it is clear that it isn't a Japanese word that has Chinese characters in which we can denote meaning from. The oldest known written references to Naihanchi are in the books of Funakoshi in 1922 and Motobu Choki in 1926. Funakoshi attributes the form to Shorei-Ryu 昭霊流 (Shaolin). Motobu Choki states the kata was imported from China, but is no longer practiced there. He claims he learned the kata from Sokon Matsumura, Sakuma Pechin, Anko Itosu and Kosaku Matsumora which means the form is older. There is currently no corroborative evidence (I know of) of this form being practiced in Chinese martial arts. You can see the grip and stance are aligned in the same fashion, the movements are brisk and short, but explosive and strong. 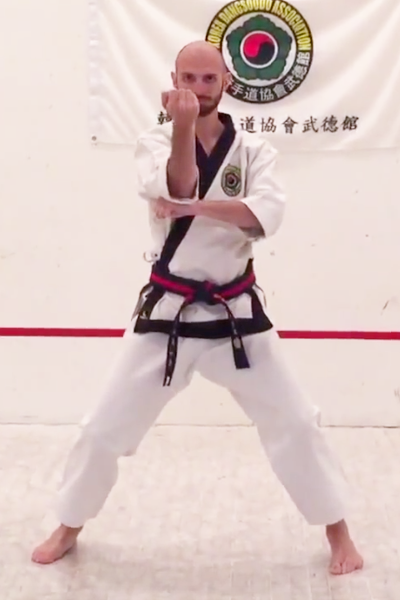 And Naihanchi is such an important hyung that it's practiced by the majority of Karate styles (along with a few others, Pyong Ahn, Bassai, Kong Song Koon and Seishan). In Dang (Tang) Soo Do, the Boonhae (Analysis) of the hyung is often an afterthought. Spending most of our time memorizing the hyung, and testing fairly quickly only to move on and memorize another, and another, etc... It isn't until many years into training does the Boonhae ever get addressed (or ever for many). And while the actual performance of the technique is of course the first priority, it is only the surface. With such a seemingly simple and short hyung such as Naihanchi, it's hard to imagine the depth of knowledge it holds. And it's this depth, this wealth of information that is included in hyung that is the greatest resource for us as traditional martial artists. Take some time, get to know the form... really KNOW it, not just memorize and perform using mimicry. Know it.